"Compassion" The main colors of this painting are a warm brown caramel, reds, browns touches of white and green and dark brown. The painting is earthy and has a warm feeling to it. I painted it using a large palette knife, please see the second photo for the texture. 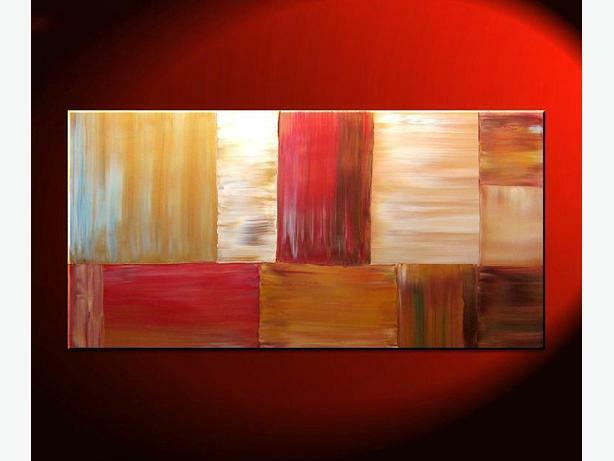 This contemporary abstract piece measures a HUGE 48"x 36". It is painted over a 1" hand stretched, gallery-wrapped canvas with the edges painted black, and a protective glossy varnish is applied to make this painting last. This painting is a great size for above a couch or an amazing focal point in your bedroom! The painting is signed, dated and numbered in the back, I didn't want to put the signature in the front so the painting can be hung in either direction.